Parties in favour of Catalan independence have obtained an overall majority in terms of seats at the regional elections, which attracted an unusually high turnout (77.44%). Although the pro-independence alliance Junts pel Sí (Together for Yes) fell six seats short of the 68 needed for a majority in the 135-seat parliament, it will secure an overall majority with the addition of the ten seats won by the far-left pro-independence Popular Unity Candidacy (CUP). Artur Mas, the regional president and key figure behind Catalonia’s shift towards independence, indicated that the result vindicated his strategy. But even though they can now assemble a parliamentary majority, the two parties just failed to win a combined 50% of the vote, and those opposed to independence are nevertheless likely to argue that their opponents don’t have a mandate to press on with their secessionist plans. They will still do so – but they face a number of challenges. It’s by no means clear that CUP, which has been highly critical of Mas, will support his leadership. A far-left party, CUP has little in common with the centre-right Mas other than its desire for independence. The party has relentlessly attacked his economic austerity programme, while criticising the numerous corruption allegations which have damaged the credibility of the president’s party, Democratic Convergence of Catalonia. CUP also indicated during the campaign that it considered a majority of the popular vote a prerequisite for any formal move towards independence. Negotiations within the pro-independence camp in the post-election period are therefore likely to be protracted. Even if he wins CUP’s support, Mas will have to provide some actual detail on how his independence strategy will be implemented – especially on his proposed 18-month “transition period”. Then there are the recent warnings from EU heads of government, including Germany’s Angela Merkel and the UK’s David Cameron, that an independent Catalonia cannot expect to be automatically accepted as a new EU member state. It remains to be seen whether the Spanish general election, which takes place in December, will return a government more sympathetic to the notion of Catalan independence. Although Mariano Rajoy’s People’s Party is currently on course to win the election, it is unlikely that it will be able to secure a clear majority. The ascendant centre-right party Ciudadanos (Citizens) has eaten into the PP’s national vote over the last two years, and in the Catalan polls – running under its Catalan name, Ciutadans – it won more votes than any other party opposed to independence. Indeed, the PP obtained less than half of the votes obtained by Ciutadans, although the PP has never been a dominant force in Catalonia due to the competition provided by centre-right Catalan nationalism. Whether the PP will be able to call on the support of Ciudadanos after the general election will be one of the key issues once the polls close. Unlike Ciudadanos, the other newcomer on the Spanish political scene, Podemos (We Can)had a disappointing Catalan election. Despite the party’s attempts to emphasise its appeal beyond traditional left-right boundaries, it ended up running under the shared banner of Sí que es Pot (Yes We Can) in alliance with the Catalan equivalent of Izquierda Unida (United Left) and the environmentalists of Equo. 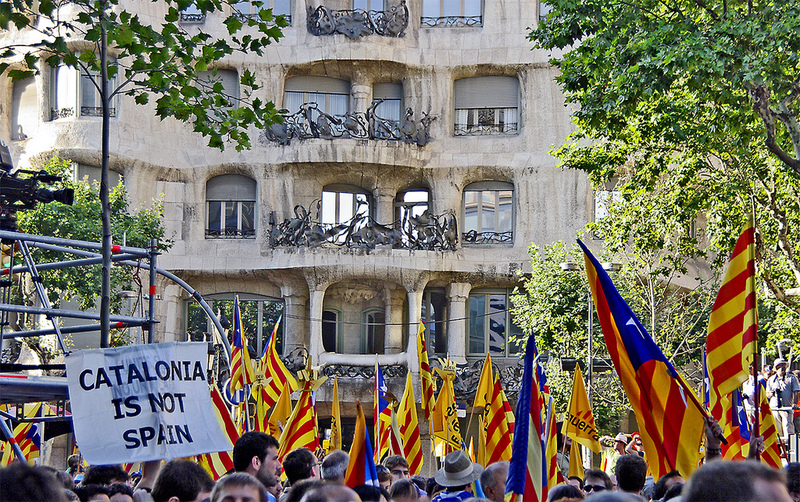 Ultimately, Sí que es Pot paid the price for its ambiguous stance on Catalan independence. Describing itself as not being within the pro-independence camp while simultaneously advocating Catalans’ “right to decide”, it was unable to siphon off votes from CUP, which benefited from Sí que es Pot’s lacklustre campaign. Podemos leader Pablo Iglesias has been left to console himself with having obtained more votes than the PP. Finally, the Socialist PSOE’s Catalan sister party, the PSC, could take heart from the fact that its endorsement of the PSOE’s outright rejection of independence did not cost it even more seats. Relief, rather than satisfaction, characterised the Socialists’ response to the election – although the result hardly bodes well for the PSOE at the general election. Paul Kennedy is a Lecturer in Spanish and European Studies, University of Bath. This article was first published on The Conversation and can be found here. Image credit: CC by Andreas Klinke Johannsen/Flickr. Previous Post He has a beef with David Cameron, but who is Lord Ashcroft? Next Post Why are the Gulf states so reluctant to take in refugees?